Blue Fin Venue, a new events space on London's South Bank with views over St Paul's Cathedral and Tate Modern, was launched last night (11 November). 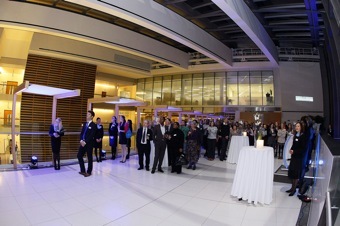 Guests were welcomed to the double-storey glass Wintergarden with a Blue Fin champagne cocktail and a tour of the venue. Home to publishing firm IPC Media, Blue Fin Venue’s meeting rooms accommodate up to 40 people. A lecture theatre for up to 96 guests is also available for hire. A double storey glass reception space, known as the Wintergarden, is available for Christmas functions, networking events or private parties. Whilst, the reception area offers a contemporary space, overlooking the building’s atrium. The venue also has landscaped gardens on the 10th floor, which can be used for break-outs, as well as an unusual event space for receptions. The Blue Sky Lounge can further be transformed into a large event space overlooking St Paul's Cathedral and the Thames. Sodexo Prestige London, managing director James Greetham said: "We're excited to welcome Blue Fin Venue to our London portfolio. The venue's versatility and diversity will complement the vibrant London conference scene. Sodexo Prestige will provide an all inclusive event management service."